This issue differs very slightly from the first issue. 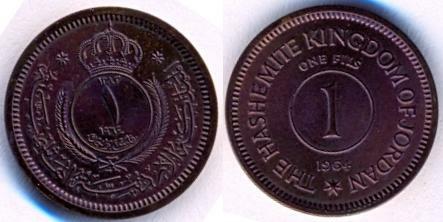 The only difference is that the English side of the coin reads "THE HASHEMITE KINGDOM OF JORDAN" whereas the 1st Issue coins read "The Hashemite Kingdom of the Jordan". This issue consists of 28 coins: 1955 (5 coins), 1960 (3 coins) containing 1 Fils AH1379 while the rest are AH1380, 1962 (4 coins), 1963 (1 coin), 1964 (7 coins), 1965 (6 coins), and 1967 (2 coins). 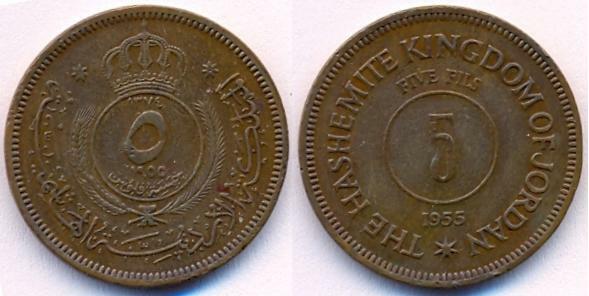 Note that the 1964 issue has two versions of the 5 Fils denomination. This is because the first variation of the coin bears Islamic "AH" date 1383, while the second variation bears the date 1384. Keep in mind that the Islamic calendar is not in sync with the Gregorian calendar and is based on the lunar cycle. KM#8 1 Fils. Year: AH1374 - 1955. Weight: 3.00g. Metal: Bronze. Diameter: 18.00 mm. Edge: Plain. Alignment: Medal. Mint: British Royal Mint. Obverse: Value and date within crowned circle having sprigs below. Al-Mamlaka(t) Al-Urduniya(t) Al-Hashemiya(t) written outside the circle. Two stars on both sides of the crown. Reverse: Denomination in circle. Value above and date below the circle. "The Hashemite Kingdom of Jordan" written outside the circle with a star at the bottom. Mintage: 200,000 + Proof. Minted Years: AH1374-1955, AH1379-1960, AH1382-1963, AH1383-1964 and AH1385-1965. Ruler: Hussein ibn Talal. 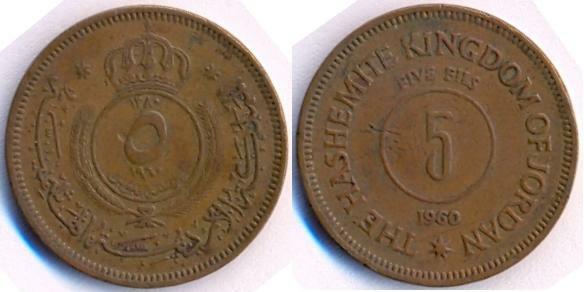 KM#9 5 Fils (½ Qirsh). Year: AH1374 - 1955. Weight: 5.90g. Metal: Bronze. Diameter: 24.00 mm. Edge: Plain. Alignment: Medal. Mint: British Royal Mint. Obverse: Value and date within crowned circle having sprigs below. Al-Mamlaka(t) Al-Urduniya(t) Al-Hashemiya(t) written outside the circle. Two stars on both sides of the crown. Reverse: Denomination in circle. Value above and date below the circle. "The Hashemite Kingdom of Jordan" written outside the circle with a star at the bottom. Mintage: 3,500,000 + Proof. Minted Years: AH1374-1955, AH1380-1960, AH1382-1962, AH1383-1964, AH1384-1964, AH1385-1965 and AH1387-1967. Ruler: Hussein ibn Talal. KM#10 10 Fils (Qirsh). Year: AH1374 - 1955. Weight: 9.90g. Metal: Bronze. Diameter: 27.50 mm. Edge: Plain. Alignment: Medal. Mint: British Royal Mint. Obverse: Value and date within crowned circle having sprigs below. Al-Mamlaka(t) Al-Urduniya(t) Al-Hashemiya(t) written outside the circle. Two stars on both sides of the crown. Reverse: Denomination in circle. Value above and date below the circle. "The Hashemite Kingdom of Jordan" written outside the circle with a star at the bottom. Mintage: 1,500,000 + Proof. Minted Years: AH1374-1955, AH1380-1960, AH1382-1962, AH1383-1964, AH1385-1965 and AH1387-1967. Ruler: Hussein ibn Talal. KM#11 50 Fils (½ Dirham). Year: AH1374 - 1955. Weight: 7.42g. Metal: Copper-Nickel. Diameter: 26.00 mm. Edge: Reeded. Alignment: Medal. Mint: British Royal Mint. Obverse: Value and date within crowned circle having sprigs below. Al-Mamlaka(t) Al-Urduniya(t) Al-Hashemiya(t) written outside the circle. Two stars on both sides of the crown. Reverse: Denomination in circle. Value above and date below the circle. "The Hashemite Kingdom of Jordan" written outside the circle with a star at the bottom. Mintage: 2,500,000 + Proof. Minted Years: AH1374-1955, AH1382-1962, AH1383-1964 and AH1385-1965. Ruler: Hussein ibn Talal. KM#12 100 Fils (Dirham). Year: AH1374 - 1955. Weight: 12.00g. Metal: Copper-Nickel. Diameter: 30.00 mm. Edge: Reeded. Alignment: Medal. Mint: British Royal Mint. Obverse: Value and date within crowned circle having sprigs below. Al-Mamlaka(t) Al-Urduniya(t) Al-Hashemiya(t) written outside the circle. Two stars on both sides of the crown. Reverse: Denomination in circle. Value above and date below the circle. "The Hashemite Kingdom of Jordan" written outside the circle with a star at the bottom. Mintage: 500,000 + Proof. Minted Years: AH1374-1955, AH1382-1962, AH1383-1964 and AH1385-1965. Ruler: Hussein ibn Talal. KM#8 1 Fils. Year: AH1379 - 1960. Weight: 3.00g. Metal: Bronze. Diameter: 18.00 mm. Edge: Plain. Alignment: Medal. Mint: British Royal Mint. Obverse: Value and date within crowned circle having sprigs below. Al-Mamlaka(t) Al-Urduniya(t) Al-Hashemiya(t) written outside the circle. Two stars on both sides of the crown. Reverse: Denomination in circle. Value above and date below the circle. "The Hashemite Kingdom of Jordan" written outside the circle with a star at the bottom. Mintage: 150,000 + Proof. Minted Years: AH1374-1955, AH1379-1960, AH1382-1963, AH1383-1964 and AH1385-1965. Ruler: Hussein ibn Talal. 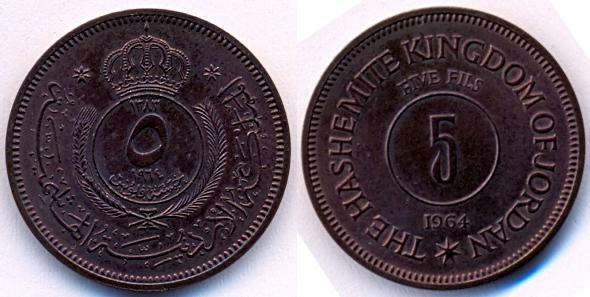 KM#9 5 Fils (½ Qirsh). Year: AH1380 - 1960. Weight: 5.90g. Metal: Bronze. Diameter: 24.00 mm. Edge: Plain. Alignment: Medal. Mint: British Royal Mint. Obverse: Value and date within crowned circle having sprigs below. Al-Mamlaka(t) Al-Urduniya(t) Al-Hashemiya(t) written outside the circle. Two stars on both sides of the crown. Reverse: Denomination in circle. Value above and date below the circle. "The Hashemite Kingdom of Jordan" written outside the circle with a star at the bottom. Mintage: 540,000 + Proof. Minted Years: AH1374-1955, AH1380-1960, AH1382-1962, AH1383-1964, AH1384-1964, AH1385-1965 and AH1387-1967. Ruler: Hussein ibn Talal. KM#10 10 Fils (Qirsh). Year: AH1380 - 1960. Weight: 9.90g. Metal: Bronze. Diameter: 27.50 mm. Edge: Plain. Alignment: Medal. Mint: British Royal Mint. Obverse: Value and date within crowned circle having sprigs below. Al-Mamlaka(t) Al-Urduniya(t) Al-Hashemiya(t) written outside the circle. Two stars on both sides of the crown. Reverse: Denomination in circle. Value above and date below the circle. "The Hashemite Kingdom of Jordan" written outside the circle with a star at the bottom. Mintage: 60,000 + Proof. Minted Years: AH1374-1955, AH1380-1960, AH1382-1962, AH1383-1964, AH1385-1965 and AH1387-1967. Ruler: Hussein ibn Talal. 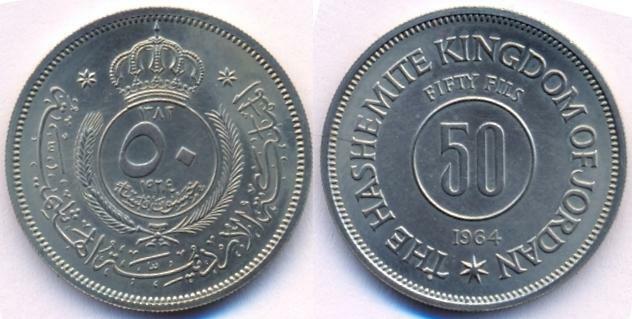 KM#9 5 Fils (½ Qirsh). Year: AH1382 - 1962. Weight: 5.90g. Metal: Bronze. Diameter: 24.00 mm. Edge: Plain. Alignment: Medal. Mint: British Royal Mint. Obverse: Value and date within crowned circle having sprigs below. Al-Mamlaka(t) Al-Urduniya(t) Al-Hashemiya(t) written outside the circle. Two stars on both sides of the crown. Reverse: Denomination in circle. Value above and date below the circle. "The Hashemite Kingdom of Jordan" written outside the circle with a star at the bottom. Mintage: 250,000 + Proof. Minted Years: AH1374-1955, AH1380-1960, AH1382-1962, AH1383-1964, AH1384-1964, AH1385-1965 and AH1387-1967. Ruler: Hussein ibn Talal. KM#10 10 Fils (Qirsh). Year: AH1382 - 1962. Weight: 9.90g. Metal: Bronze. Diameter: 27.50 mm. Edge: Plain. Alignment: Medal. Mint: British Royal Mint. Obverse: Value and date within crowned circle having sprigs below. Al-Mamlaka(t) Al-Urduniya(t) Al-Hashemiya(t) written outside the circle. Two stars on both sides of the crown. Reverse: Denomination in circle. Value above and date below the circle. "The Hashemite Kingdom of Jordan" written outside the circle with a star at the bottom. Mintage: 2,300,000 + Proof. Minted Years: AH1374-1955, AH1380-1960, AH1382-1962, AH1383-1964, AH1385-1965 and AH1387-1967. Ruler: Hussein ibn Talal. 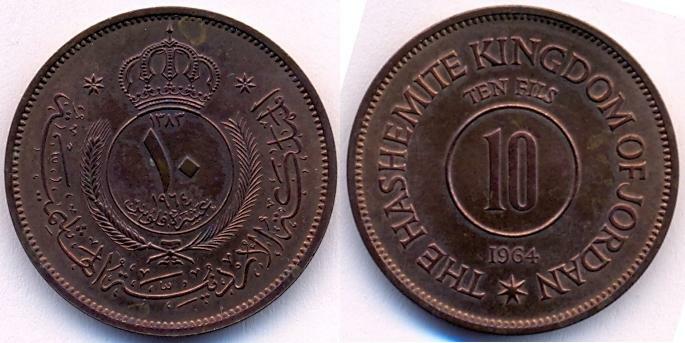 KM#11 50 Fils (½ Dirham). Year: AH1382 - 1962. Weight: 7.40g. Metal: Copper-Nickel. Diameter: 26.00 mm. Edge: Reeded. Alignment: Medal. Mint: British Royal Mint. Obverse: Value and date within crowned circle having sprigs below. Al-Mamlaka(t) Al-Urduniya(t) Al-Hashemiya(t) written outside the circle. Two stars on both sides of the crown. Reverse: Denomination in circle. Value above and date below the circle. "The Hashemite Kingdom of Jordan" written outside the circle with a star at the bottom. Mintage: 750,000 + Proof. Minted Years: AH1374-1955, AH1382-1962, AH1383-1964 and AH1385-1965. Ruler: Hussein ibn Talal. KM#12 100 Fils (Dirham). Year: AH1382 - 1962. Weight: 12.00g. Metal: Copper-Nickel. Diameter: 30.00 mm. Edge: Reeded. Alignment: Medal. Mint: British Royal Mint. Obverse: Value and date within crowned circle having sprigs below. Al-Mamlaka(t) Al-Urduniya(t) Al-Hashemiya(t) written outside the circle. Two stars on both sides of the crown. Reverse: Denomination in circle. Value above and date below the circle. "The Hashemite Kingdom of Jordan" written outside the circle with a star at the bottom. Mintage: 600,000 + Proof. Minted Years: AH1374-1955, AH1382-1962, AH1383-1964 and AH1385-1965. Ruler: Hussein ibn Talal. KM#8 1 Fils. Year: AH1382 - 1963. Weight: 3.00g. Metal: Bronze. Diameter: 18.00 mm. Edge: Plain. Alignment: Medal. Mint: British Royal Mint. Obverse: Value and date within crowned circle having sprigs below. Al-Mamlaka(t) Al-Urduniya(t) Al-Hashemiya(t) written outside the circle. Two stars on both sides of the crown. Reverse: Denomination in circle. Value above and date below the circle. "The Hashemite Kingdom of Jordan" written outside the circle with a star at the bottom. Mintage: 200,000 + Proof. Minted Years: AH1374-1955, AH1379-1960, AH1382-1963, AH1383-1964 and AH1385-1965. Ruler: Hussein ibn Talal. KM#8 1 Fils. Year: AH1383 - 1964. Weight: 3.00g. Metal: Bronze. Diameter: 18.00 mm. Edge: Plain. Alignment: Medal. Mint: British Royal Mint. Obverse: Value and date within crowned circle having sprigs below. Al-Mamlaka(t) Al-Urduniya(t) Al-Hashemiya(t) written outside the circle. Two stars on both sides of the crown. Reverse: Denomination in circle. Value above and date below the circle. "The Hashemite Kingdom of Jordan" written outside the circle with a star at the bottom. Mintage: 3,000 (in sets only). Minted Years: AH1374-1955, AH1379-1960, AH1382-1963, AH1383-1964 and AH1385-1965. Ruler: Hussein ibn Talal. 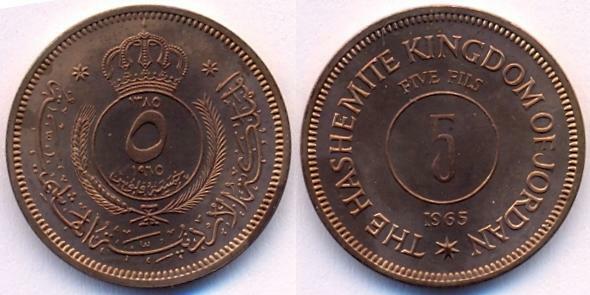 KM#9 5 Fils (½ Qirsh). Year: AH1383 - 1964. Weight: 5.90g. Metal: Bronze. Diameter: 24.00 mm. Edge: Plain. Alignment: Medal. Mint: British Royal Mint. Obverse: Value and date within crowned circle having sprigs below. Al-Mamlaka(t) Al-Urduniya(t) Al-Hashemiya(t) written outside the circle. Two stars on both sides of the crown. Reverse: Denomination in circle. Value above and date below the circle. "The Hashemite Kingdom of Jordan" written outside the circle with a star at the bottom. Mintage: 3,000 (in sets only). Minted Years: AH1374-1955, AH1380-1960, AH1382-1962, AH1383-1964, AH1384-1964, AH1385-1965 and AH1387-1967. Ruler: Hussein ibn Talal. KM#10 10 Fils (Qirsh). Year: AH1383 - 1964. Weight: 9.90g. Metal: Bronze. Diameter: 27.50 mm. Edge: Plain. Alignment: Medal. Mint: British Royal Mint. Obverse: Value and date within crowned circle having sprigs below. Al-Mamlaka(t) Al-Urduniya(t) Al-Hashemiya(t) written outside the circle. Two stars on both sides of the crown. Reverse: Denomination in circle. Value above and date below the circle. "The Hashemite Kingdom of Jordan" written outside the circle with a star at the bottom. Mintage: 1,253,000. Minted Years: AH1374-1955, AH1380-1960, AH1382-1962, AH1383-1964, AH1385-1965 and AH1387-1967. Ruler: Hussein ibn Talal. KM13 20 Fils. Year: AH1383 - 1964. Weight: 3.85g. Metal: Copper-Nickel. Diameter: 19.50 mm. Edge: Reeded. Alignment: Medal. Mint: British Royal Mint. Obverse: Value and date within crowned circle having sprigs below. Al-Mamlaka(t) Al-Urduniya(t) Al-Hashemiya(t) written outside the circle. Two stars on both sides of the crown. Reverse: Denomination in circle. Value above and date below the circle. "The Hashemite Kingdom of Jordan" written outside the circle with a star at the bottom. Mintage: 3,000 (in sets only). Minted Years: AH1383-1964 and AH1385-1965. Ruler: Hussein ibn Talal. KM#11 50 Fils (½ Dirham). Year: AH1383 - 1964. Weight: 7.40g. Metal: Copper-Nickel. Diameter: 26.00 mm. Edge: Reeded. Alignment: Medal. Mint: British Royal Mint. Obverse: Value and date within crowned circle having sprigs below. Al-Mamlaka(t) Al-Urduniya(t) Al-Hashemiya(t) written outside the circle. Two stars on both sides of the crown. Reverse: Denomination in circle. Value above and date below the circle. "The Hashemite Kingdom of Jordan" written outside the circle with a star at the bottom. Mintage: 1,003,000. Minted Years: AH1374-1955, AH1382-1962, AH1383-1964 and AH1385-1965. Ruler: Hussein ibn Talal. Same as above, but slightly off-flan (off-centered) from both sides. Reverse side has a different style of star. KM#12 100 Fils (Dirham). Year: AH1383 - 1964. Weight: 12.00g. Metal: Copper-Nickel. Diameter: 30.00 mm. Edge: Reeded. Alignment: Medal. Mint: British Royal Mint. Obverse: Value and date within crowned circle having sprigs below. Al-Mamlaka(t) Al-Urduniya(t) Al-Hashemiya(t) written outside the circle. Two stars on both sides of the crown. Reverse: Denomination in circle. Value above and date below the circle. "The Hashemite Kingdom of Jordan" written outside the circle with a star at the bottom. Mintage: 3,000 (in sets only). Minted Years: AH1374-1955, AH1382-1962, AH1383-1964 and AH1385-1965. Ruler: Hussein ibn Talal. 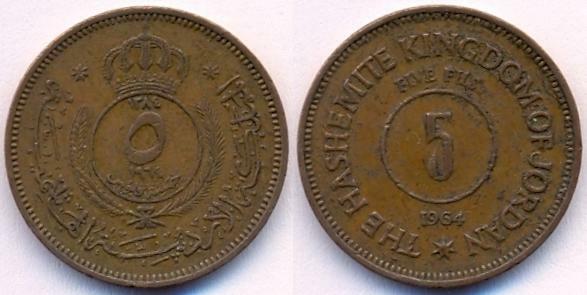 KM#9 5 Fils (½ Qirsh). Year: AH1384 - 1964. Weight: 5.90g. Metal: Bronze. Diameter: 24.00 mm. Edge: Plain. Alignment: Medal. Mint: British Royal Mint. Obverse: Value and date within crowned circle having sprigs below. Al-Mamlaka(t) Al-Urduniya(t) Al-Hashemiya(t) written outside the circle. Two stars on both sides of the crown. Reverse: Denomination in circle. Value above and date below the circle. "The Hashemite Kingdom of Jordan" written outside the circle with a star at the bottom. Mintage: 2,500,000. Minted Years: AH1374-1955, AH1380-1960, AH1382-1962, AH1383-1964, AH1384-1964, AH1385-1965 and AH1387-1967. Ruler: Hussein ibn Talal. KM#8 1 Fils. Year: AH1385 - 1965. Weight: 3.00g. Metal: Bronze. Diameter: 18.00 mm. Edge: Plain. Alignment: Medal. Mint: British Royal Mint. Obverse: Value and date within crowned circle having sprigs below. Al-Mamlaka(t) Al-Urduniya(t) Al-Hashemiya(t) written outside the circle. Two stars on both sides of the crown. Reverse: Denomination in circle. Value above and date below the circle. "The Hashemite Kingdom of Jordan" written outside the circle with a star at the bottom. Mintage: 5,000 (in sets only). Minted Years: AH1374-1955, AH1379-1960, AH1382-1963, AH1383-1964 and AH1385-1965. Ruler: Hussein ibn Talal. 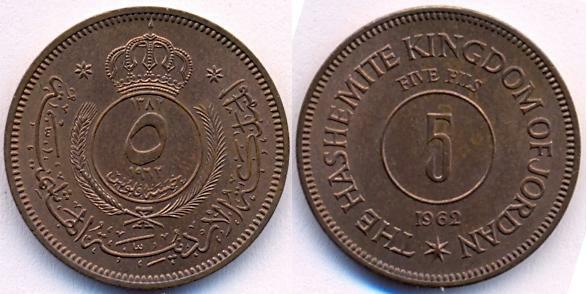 KM#9 5 Fils (½ Qirsh). Year: AH1385 - 1965. Weight: 5.90g. Metal: Bronze. Diameter: 24.00 mm. Edge: Plain. Alignment: Medal. Mint: British Royal Mint. Obverse: Value and date within crowned circle having sprigs below. Al-Mamlaka(t) Al-Urduniya(t) Al-Hashemiya(t) written outside the circle. Two stars on both sides of the crown. Reverse: Denomination in circle. Value above and date below the circle. "The Hashemite Kingdom of Jordan" written outside the circle with a star at the bottom. Mintage: 5,000 (in sets only) + 10,000 Proof. Minted Years: AH1374-1955, AH1380-1960, AH1382-1962, AH1383-1964, AH1384-1964, AH1385-1965 and AH1387-1967. Ruler: Hussein ibn Talal. KM#10 10 Fils (Qirsh). Year: AH1385 - 1965. Weight: 9.90g. Metal: Bronze. Diameter: 27.50 mm. Edge: Plain. Alignment: Medal. Mint: British Royal Mint. Obverse: Value and date within crowned circle having sprigs below. Al-Mamlaka(t) Al-Urduniya(t) Al-Hashemiya(t) written outside the circle. Two stars on both sides of the crown. Reverse: Denomination in circle. Value above and date below the circle. "The Hashemite Kingdom of Jordan" written outside the circle with a star at the bottom. Mintage: 1,003,000 + 10,000 Proof. Minted Years: AH1374-1955, AH1380-1960, AH1382-1962, AH1383-1964, AH1385-1965 and AH1387-1967. Ruler: Hussein ibn Talal. KM#13 20 Fils. Year: AH1385 - 1965. Weight: 3.85g. Metal: Copper-Nickel. Diameter: 19.50 mm. Edge: Reeded. Alignment: Medal. Mint: British Royal Mint. Obverse: Value and date within crowned circle having sprigs below. Al-Mamlaka(t) Al-Urduniya(t) Al-Hashemiya(t) written outside the circle. Two stars on both sides of the crown. Reverse: Denomination in circle. Value above and date below the circle. "The Hashemite Kingdom of Jordan" written outside the circle with a star at the bottom. Mintage: 5,000 (in sets only). Minted Years: AH1383-1964 and AH1385-1965. Ruler: Hussein ibn Talal. 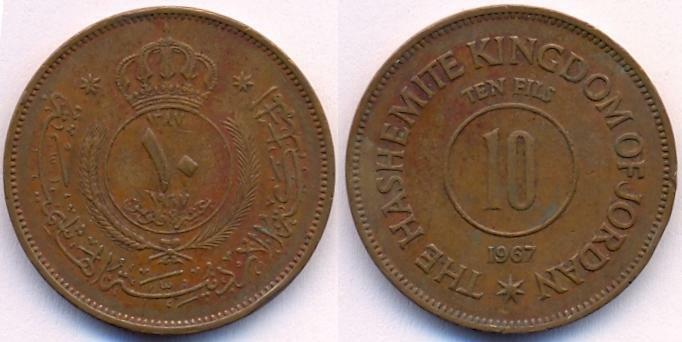 KM#11 50 Fils (½ Dirham). Year: AH1385 - 1965. Weight: 7.40g. Metal: Copper-Nickel. Diameter: 26.00 mm. Edge: Reeded. Alignment: Medal. Mint: British Royal Mint. Obverse: Value and date within crowned circle having sprigs below. Al-Mamlaka(t) Al-Urduniya(t) Al-Hashemiya(t) written outside the circle. Two stars on both sides of the crown. Reverse: Denomination in circle. Value above and date below the circle. "The Hashemite Kingdom of Jordan" written outside the circle with a star at the bottom. Mintage: 1,505,000 + 10,000 Proof. Minted Years: AH1374-1955, AH1382-1962, AH1383-1964 and AH1385-1965. Ruler: Hussein ibn Talal. KM#12 100 Fils (Dirham). Year: AH1385 - 1965. Weight: 12.00g. Metal: Copper-Nickel. Diameter: 30.00 mm. Edge: Reeded. Alignment: Medal. Mint: British Royal Mint. Obverse: Value and date within crowned circle having sprigs below. Al-Mamlaka(t) Al-Urduniya(t) Al-Hashemiya(t) written outside the circle. Two stars on both sides of the crown. Reverse: Denomination in circle. Value above and date below the circle. "The Hashemite Kingdom of Jordan" written outside the circle with a star at the bottom. Mintage: 405,000 + 10,000 Proof. Minted Years: AH1374-1955, AH1382-1962, AH1383-1964 and AH1385-1965. Ruler: Hussein ibn Talal. 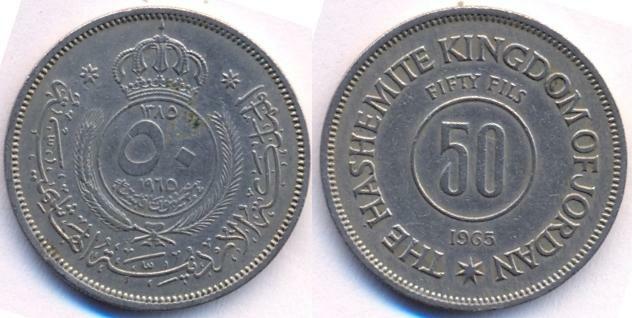 KM#9 5 Fils (½ Qirsh). Year: AH1387 - 1967. Weight: 5.90g. Metal: Bronze. Diameter: 24.00 mm. Edge: Plain. Alignment: Medal. Mint: British Royal Mint. Obverse: Value and date within crowned circle having sprigs below. Al-Mamlaka(t) Al-Urduniya(t) Al-Hashemiya(t) written outside the circle. Two stars on both sides of the crown. Reverse: Denomination in circle. Value above and date below the circle. "The Hashemite Kingdom of Jordan" written outside the circle with a star at the bottom. Mintage: 2,000,000. Minted Years: AH1374-1955, AH1380-1960, AH1382-1962, AH1383-1964, AH1384-1964, AH1385-1965 and AH1387-1967. Ruler: Hussein ibn Talal. KM#10 10 Fils (Qirsh). Year: AH1387 - 1967. Weight: 9.90g. Metal: Bronze. Diameter: 27.50 mm. Edge: Plain. Alignment: Medal. Mint: British Royal Mint. Obverse: Value and date within crowned circle having sprigs below. Al-Mamlaka(t) Al-Urduniya(t) Al-Hashemiya(t) written outside the circle. Two stars on both sides of the crown. Reverse: Denomination in circle. Value above and date below the circle. "The Hashemite Kingdom of Jordan" written outside the circle with a star at the bottom. Mintage: 1,000,000. Minted Years: AH1374-1955, AH1380-1960, AH1382-1962, AH1383-1964, AH1385-1965 and AH1387-1967. Ruler: Hussein ibn Talal. 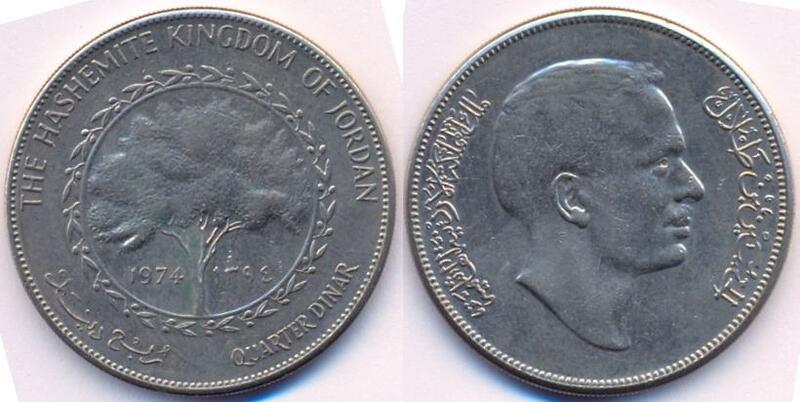 This issue was introduced shortly after the Central Bank of Jordan replaced the Jordan Currency Board (1964). 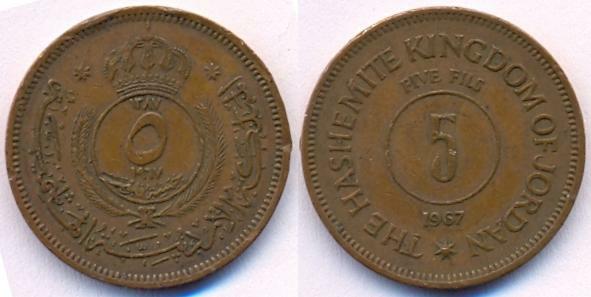 Initially, the same denominations that had been in circulation previously were kept, with one exception: the 20 Fils was replaced by a 25 Fils. 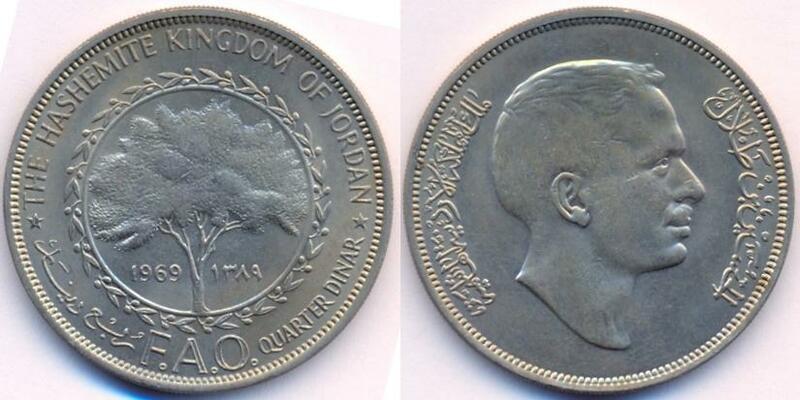 Shortly afterwards, however, a ¼ Dinar (250 Fils) denomination was also introduced. 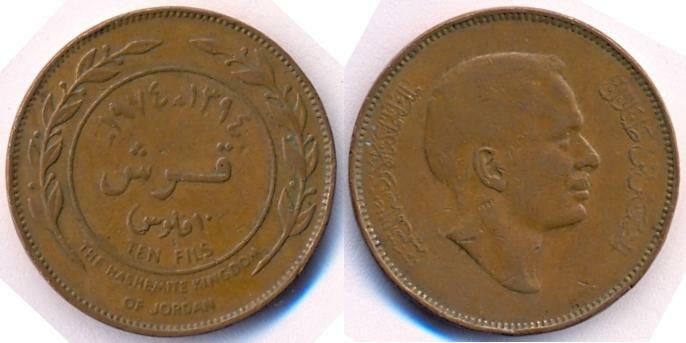 One side of the coins featured the denomination and date while the other featured the young King Hussein ibn Talal portrait of Jordan. All in all, this issue consists of 27 common circulated coins: 1968 (6 coins), 1970 (5 coins), 1972 (2 coins), 1974 (5 coins), 1975 (6 coins), and 1977 (3 coins). Some commemorative coins are also issued during this time including silver and gold from 1969 onwards. KM#14 1 Fils. Year: AH1387 - 1968. Weight: 3.00g. Metal: Bronze. Diameter: 18.00 mm. Edge: Plain. Alignment: Medal. Mint: British Royal Mint. Obverse: Value and date within circle surrounded by sprigs. "The Hashemite Kingdom of Jordan" written outside the circle at bottom. Reverse: "Al-Mamlaka(t) Al-Urduniya(t) Al-Hashemiya(t)" written on the left side anti-clockwise. "Hussein ibn Talal" on the right side anti-clockwise. Hussein ibn Talal. portrait in center facing right. Mintage: 60,000. Minted Years: One year type. Ruler: Hussein ibn Talal. 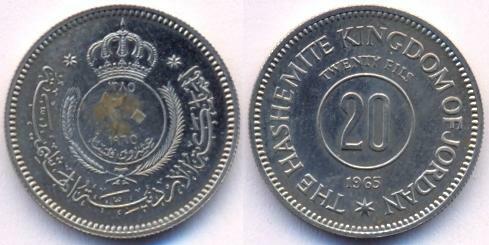 KM#15 5 Fils (½ Qirsh). Year: AH1387 - 1967. Weight: 5.90g. Metal: Bronze. Diameter: 24.00 mm. Edge: Plain. Alignment: Medal. Mint: British Royal Mint. Obverse: Value and date within circle surrounded by sprigs. "The Hashemite Kingdom of Jordan" written outside the circle at bottom. Reverse: "Al-Mamlaka(t) Al-Urduniya(t) Al-Hashemiya(t)" written on the left side anti-clockwise. "Hussein ibn Talal" on the right side anti-clockwise. Hussein ibn Talal. portrait in center facing right. Mintage: 800,000. Minted Years: AH1387-1968, AH1390-1970, AH1392-1972, AH1394-1974 and AH1395-1975. Ruler: Hussein ibn Talal. KM#16 10 Fils (Qirsh). Year: AH1387 - 1967. Weight: 9.90g. Metal: Bronze. Diameter: 27.50 mm. Edge: Plain. Alignment: Medal. Mint: British Royal Mint. Obverse: Value and date within circle surrounded by sprigs. "The Hashemite Kingdom of Jordan" written outside the circle at bottom. Reverse: "Al-Mamlaka(t) Al-Urduniya(t) Al-Hashemiya(t)" written on the left side anti-clockwise. "Hussein ibn Talal" on the right side anti-clockwise. Hussein ibn Talal. portrait in center facing right. Mintage: 500,000. Minted Years: AH1387-1968, AH1390-1970, AH1392-1972, AH1394-1974 and AH1395-1975. Ruler: Hussein ibn Talal. KM#17 25 Fils (¼ Dirham). Year: AH1387 - 1967. Weight: 4.75g. Metal: Copper-Nickel. Diameter: 22.00 mm. Edge: Reeded. Alignment: Medal. Mint: British Royal Mint. Obverse: Value and date within circle surrounded by sprigs. "The Hashemite Kingdom of Jordan" written outside the circle at bottom. Reverse: "Al-Mamlaka(t) Al-Urduniya(t) Al-Hashemiya(t)" written on the left side anti-clockwise. "Hussein ibn Talal" on the right side anti-clockwise. Hussein ibn Talal. portrait in center facing right. Mintage: 200,000. Minted Years: AH1387-1968, AH1390-1970, AH1394-1974, AH1395-1975 and AH1397-1977. Ruler: Hussein ibn Talal. KM#18 50 Fils (½ Dirham). Year: AH1387 - 1968. Weight: 7.40g. Metal: Copper-Nickel. Diameter: 26.00 mm. Edge: Reeded. Alignment: Medal. Mint: British Royal Mint. Obverse: Value and date within circle surrounded by sprigs. "The Hashemite Kingdom of Jordan" written outside the circle at bottom. Reverse: "Al-Mamlaka(t) Al-Urduniya(t) Al-Hashemiya(t)" written on the left side anti-clockwise. "Hussein ibn Talal" on the right side anti-clockwise. Hussein ibn Talal. portrait in center facing right. Mintage: 400,000. Minted Years: AH1387-1968, AH1390-1970, AH1394-1974, AH1395-1975 and AH1397-1977. Ruler: Hussein ibn Talal. 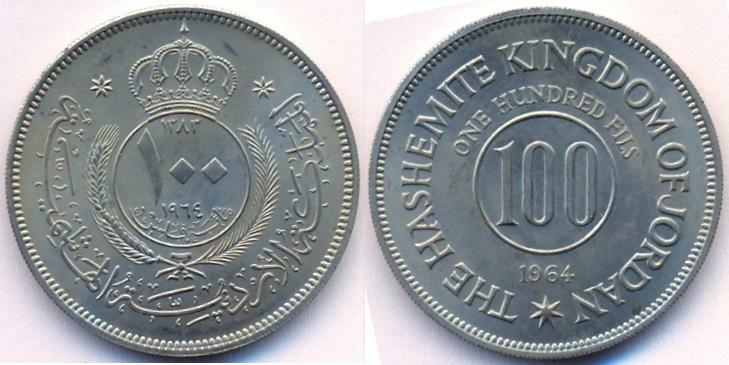 KM#19 100 Fils (Dirham). Year: AH1387 - 1968. Weight: 12.00g. Metal: Copper-Nickel. Diameter: 30.00 mm. Edge: Reeded. Alignment: Medal. Mint: British Royal Mint. Obverse: Value and date within circle surrounded by sprigs. "The Hashemite Kingdom of Jordan" written outside the circle at bottom. Reverse: "Al-Mamlaka(t) Al-Urduniya(t) Al-Hashemiya(t)" written on the left side anti-clockwise. "Hussein ibn Talal" on the right side anti-clockwise. Hussein ibn Talal. portrait in center facing right. Mintage: 175,000. Minted Years: AH1387-1968, AH1395-1975 and AH1397-1977. Ruler: Hussein ibn Talal. KM#20 ¼ Dinar (250 fils). Year: AH1389 - 1969. Weight: 17.00g. Metal: Copper-Nickel. Diameter: 34.00 mm. Edge: Reeded. Alignment: Medal. Mint: British Royal Mint. Obverse: Date within circle with a tree image, surrounded by sprigs. "The Hashemite Kingdom of Jordan" written outside, above the circle. FAO with written denominations in Arabic and English below the circle. Reverse: "Al-Mamlaka(t) Al-Urduniya(t) Al-Hashemiya(t)" written on the left side anti-clockwise. "Hussein ibn Talal" on the right side anti-clockwise. Hussein ibn Talal. portrait in center facing right. Mintage: 60,000. Minted Years: One year type. Ruler: Hussein ibn Talal. Subject: FAO issue. KM#23 Dinar. Year: AH1389 - 1969. Weight: 40.00g. Metal: 0.999 Silver. Diameter: 55.00 mm. Edge: Reeded. Alignment: Coin. Mint: Italcambio Mint, Arezzo, Italy. 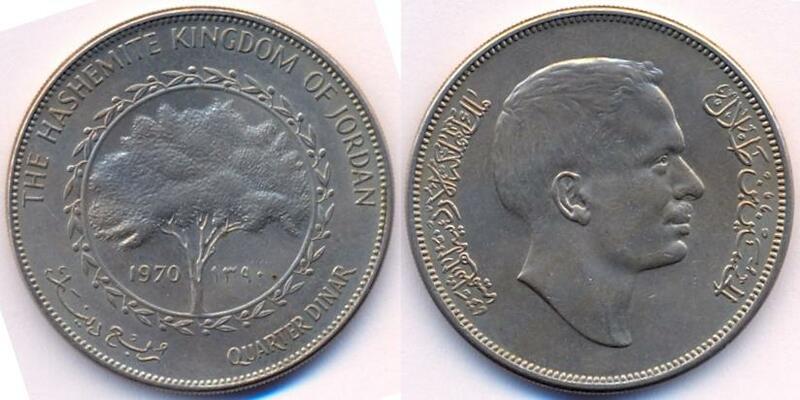 Obverse: "The Hashemite Kingdom of Jordan" written above. Temple Hill, Jerusalem image in circle. Oval mark of "1000" below HAS and outside the circle. 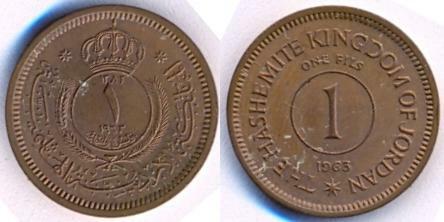 English denomination and date below the circle. Reverse: "Al-Mamlaka(t) Al-Urduniya(t) Al-Hashemiya(t)" written on the right side clockwise. "Hussein ibn Talal" on the left side anti-clockwise. Hussein ibn Talal. portrait in center facing right. 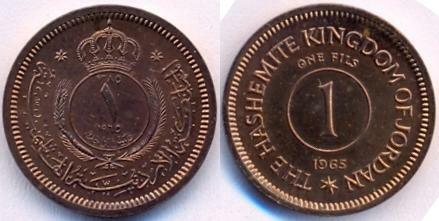 Arabic denomination and date below. Mintage: 6,800. Minted Years: One year type. Ruler: Hussein ibn Talal. COA: Bylaw No (61) for the year 1968 as per decision taken by the Council of Ministers on 16.12.1968. Authorized by Central Bank of Jordan. 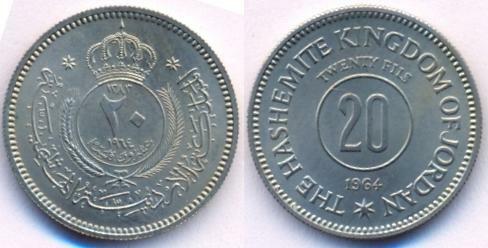 KM#21 ½ Dinar 20.00g 0.999 Silver featuring Al-Harraneh Palace (Mintage: 6,100). KM#22 3/4 Dinar 30.00g 0.999 Silver featuring Shrine of the Nativity - Bethlehem (Mintage: 5,800). KM#24 2 Dinars 5.52g 0.900 Gold 21mm featuring Forum in Jerash (Mintage: 2,425). KM#25 5 Dinars 13.82g 0.900 Gold 31mm featuring Treasury in Petra (Mintage: 1,950). KM#26 10 Dinars 27.64g 0.900 Gold 40mm featuring Visit of Pope Paul VI (Mintage: 1,870). KM#27 25 Dinars 69.11g 0.900 Gold 48mm featuring Dome of Rock - Jerusalem (Mintage: 1,000). 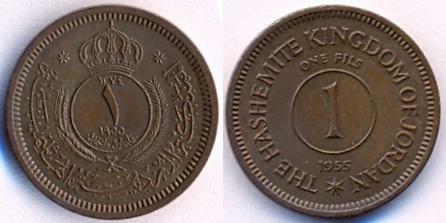 KM#15 5 Fils (½ Qirsh). Year: AH1390 - 1970. Weight: 5.90g. Metal: Bronze. Diameter: 24.00 mm. Edge: Plain. Alignment: Medal. Mint: British Royal Mint. Obverse: Value and date within circle surrounded by sprigs. "The Hashemite Kingdom of Jordan" written outside the circle at bottom. Reverse: "Al-Mamlaka(t) Al-Urduniya(t) Al-Hashemiya(t)" written on the left side anti-clockwise. "Hussein ibn Talal" on the right side anti-clockwise. Hussein ibn Talal. portrait in center facing right. Mintage: 1,400,000. Minted Years: AH1387-1968, AH1390-1970, AH1392-1972, AH1394-1974 and AH1395-1975. Ruler: Hussein ibn Talal. KM#16 10 Fils (Qirsh). Year: AH1390 - 1970. Weight: 9.90g. Metal: Bronze. Diameter: 27.50 mm. Edge: Plain. Alignment: Medal. Mint: British Royal Mint. Obverse: Value and date within circle surrounded by sprigs. "The Hashemite Kingdom of Jordan" written outside the circle at bottom. Reverse: "Al-Mamlaka(t) Al-Urduniya(t) Al-Hashemiya(t)" written on the left side anti-clockwise. "Hussein ibn Talal" on the right side anti-clockwise. Hussein ibn Talal. portrait in center facing right. Mintage: 1,000,000. Minted Years: AH1387-1968, AH1390-1970, AH1392-1972, AH1394-1974 and AH1395-1975. Ruler: Hussein ibn Talal. KM#17 25 Fils (¼ Dirham). Year: AH1390 - 1970. Weight: 4.75g. Metal: Copper-Nickel. Diameter: 22.00 mm. Edge: Reeded. Alignment: Medal. Mint: British Royal Mint. Obverse: Value and date within circle surrounded by sprigs. "The Hashemite Kingdom of Jordan" written outside the circle at bottom. Reverse: "Al-Mamlaka(t) Al-Urduniya(t) Al-Hashemiya(t)" written on the left side anti-clockwise. "Hussein ibn Talal" on the right side anti-clockwise. Hussein ibn Talal. portrait in center facing right. Mintage: 240,000. Minted Years: AH1387-1968, AH1390-1970, AH1394-1974, AH1395-1975 and AH1397-1977. Ruler: Hussein ibn Talal. KM#18 50 Fils (½ Dirham). Year: AH1390 - 1970. Weight: 7.40g. Metal: Copper-Nickel. Diameter: 26.00 mm. Edge: Reeded. Alignment: Medal. Mint: British Royal Mint. Obverse: Value and date within circle surrounded by sprigs. "The Hashemite Kingdom of Jordan" written outside the circle at bottom. Reverse: "Al-Mamlaka(t) Al-Urduniya(t) Al-Hashemiya(t)" written on the left side anti-clockwise. "Hussein ibn Talal" on the right side anti-clockwise. Hussein ibn Talal. portrait in center facing right. Mintage: 1,000,000. Minted Years: AH1387-1968, AH1390-1970, AH1394-1974, AH1395-1975 and AH1397-1977. Ruler: Hussein ibn Talal. KM#28 ¼ Dinar (250 fils). Year: AH1390 - 1970. Weight: 17.00g. Metal: Copper-Nickel. Diameter: 34.00 mm. Edge: Reeded. Alignment: Medal. Mint: British Royal Mint. Obverse: Date within circle with a tree image, surrounded by sprigs. "The Hashemite Kingdom of Jordan" written outside, above the circle. Written denominations in Arabic and English below the circle. Reverse: "Al-Mamlaka(t) Al-Urduniya(t) Al-Hashemiya(t)" written on the left side anti-clockwise. "Hussein ibn Talal" on the right side anti-clockwise. Hussein ibn Talal. portrait in center facing right. Mintage: 500,000. Minted Years: AH1390-1970, AH1394-1974 and AH1395-1975. Ruler: Hussein ibn Talal. 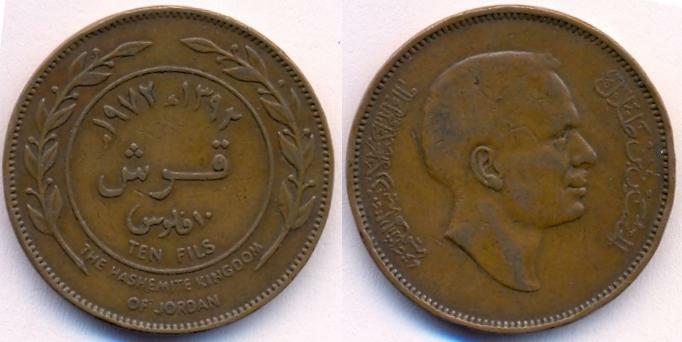 KM#15 5 Fils (½ Qirsh). Year: AH1392 - 1972. Weight: 5.90g. Metal: Bronze. Diameter: 24.00 mm. Edge: Plain. Alignment: Medal. Mint: British Royal Mint. Obverse: Value and date within circle surrounded by sprigs. "The Hashemite Kingdom of Jordan" written outside the circle at bottom. Reverse: "Al-Mamlaka(t) Al-Urduniya(t) Al-Hashemiya(t)" written on the left side anti-clockwise. "Hussein ibn Talal" on the right side anti-clockwise. Hussein ibn Talal. portrait in center facing right. Mintage: 400,000. Minted Years: AH1387-1968, AH1390-1970, AH1392-1972, AH1394-1974 and AH1395-1975. Ruler: Hussein ibn Talal. KM#16 10 Fils (Qirsh). Year: AH1392 - 1972. Weight: 9.90g. Metal: Bronze. Diameter: 27.50 mm. Edge: Plain. Alignment: Medal. Mint: British Royal Mint. Obverse: Value and date within circle surrounded by sprigs. "The Hashemite Kingdom of Jordan" written outside the circle at bottom. Reverse: "Al-Mamlaka(t) Al-Urduniya(t) Al-Hashemiya(t)" written on the left side anti-clockwise. "Hussein ibn Talal" on the right side anti-clockwise. Hussein ibn Talal. portrait in center facing right. Mintage: 600,000. Minted Years: AH1387-1968, AH1390-1970, AH1392-1972, AH1394-1974 and AH1395-1975. Ruler: Hussein ibn Talal. 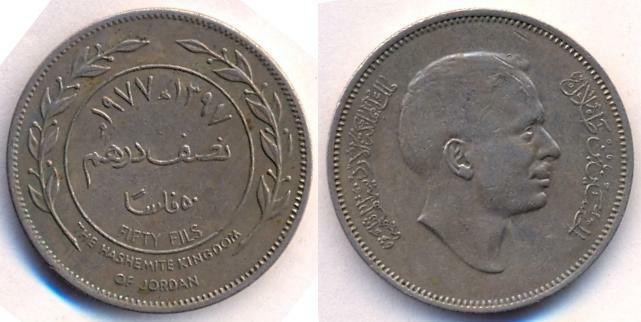 KM#15 5 Fils (½ Qirsh). Year: AH1394 - 1974. Weight: 5.90g. Metal: Bronze. Diameter: 24.00 mm. Edge: Plain. Alignment: Medal. Mint: British Royal Mint. Obverse: Value and date within circle surrounded by sprigs. "The Hashemite Kingdom of Jordan" written outside the circle at bottom. Reverse: "Al-Mamlaka(t) Al-Urduniya(t) Al-Hashemiya(t)" written on the left side anti-clockwise. "Hussein ibn Talal" on the right side anti-clockwise. Hussein ibn Talal. portrait in center facing right. Mintage: 2,000,000. Minted Years: AH1387-1968, AH1390-1970, AH1392-1972, AH1394-1974 and AH1395-1975. Ruler: Hussein ibn Talal. KM#16 10 Fils (Qirsh). Year: AH1394 - 1974. Weight: 9.90g. Metal: Bronze. Diameter: 27.50 mm. Edge: Plain. Alignment: Medal. Mint: British Royal Mint. Obverse: Value and date within circle surrounded by sprigs. "The Hashemite Kingdom of Jordan" written outside the circle at bottom. Reverse: "Al-Mamlaka(t) Al-Urduniya(t) Al-Hashemiya(t)" written on the left side anti-clockwise. "Hussein ibn Talal" on the right side anti-clockwise. Hussein ibn Talal. portrait in center facing right. Mintage: 1,000,000. Minted Years: AH1387-1968, AH1390-1970, AH1392-1972, AH1394-1974 and AH1395-1975. Ruler: Hussein ibn Talal. KM#17 25 Fils (¼ Dirham). Year: AH1394 - 1974. Weight: 4.75g. Metal: Copper-Nickel. Diameter: 22.00 mm. Edge: Reeded. Alignment: Medal. Mint: British Royal Mint. Obverse: Value and date within circle surrounded by sprigs. "The Hashemite Kingdom of Jordan" written outside the circle at bottom. Reverse: "Al-Mamlaka(t) Al-Urduniya(t) Al-Hashemiya(t)" written on the left side anti-clockwise. "Hussein ibn Talal" on the right side anti-clockwise. Hussein ibn Talal. portrait in center facing right. Mintage: 800,000. Minted Years: AH1387-1968, AH1390-1970, AH1394-1974, AH1395-1975 and AH1397-1977. Ruler: Hussein ibn Talal. KM#18 50 Fils (½ Dirham). Year: AH1394 - 1974. Weight: 7.40g. Metal: Copper-Nickel. Diameter: 26.00 mm. Edge: Reeded. Alignment: Medal. Mint: British Royal Mint. Obverse: Value and date within circle surrounded by sprigs. "The Hashemite Kingdom of Jordan" written outside the circle at bottom. Reverse: "Al-Mamlaka(t) Al-Urduniya(t) Al-Hashemiya(t)" written on the left side anti-clockwise. "Hussein ibn Talal" on the right side anti-clockwise. Hussein ibn Talal. portrait in center facing right. Mintage: 1,000,000. Minted Years: AH1387-1968, AH1390-1970, AH1394-1974, AH1395-1975 and AH1397-1977. Ruler: Hussein ibn Talal. 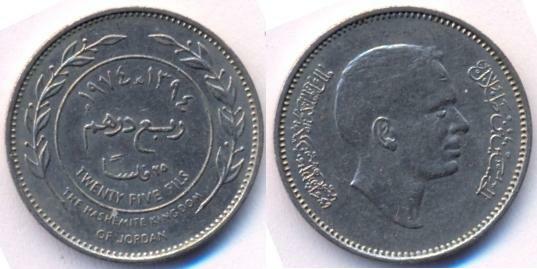 KM#28 ¼ Dinar (250 fils). Year: AH1394 - 1974. Weight: 17.00g. Metal: Copper-Nickel. Diameter: 34.00 mm. Edge: Reeded. Alignment: Medal. Mint: British Royal Mint. Obverse: Date within circle with a tree image, surrounded by sprigs. "The Hashemite Kingdom of Jordan" written outside, above the circle. Written denominations in Arabic and English below the circle. Reverse: "Al-Mamlaka(t) Al-Urduniya(t) Al-Hashemiya(t)" written on the left side anti-clockwise. "Hussein ibn Talal" on the right side anti-clockwise. Hussein ibn Talal. portrait in center facing right. Mintage: 400,000. Minted Years: AH1390-1970, AH1394-1974 and AH1395-1975. Ruler: Hussein ibn Talal. KM#29 ¼ Dinar 19.04g 0.925 silver 34mm and KM#29a ¼ Dinar 33.19g 0.917 gold 34mm were also produced this year to celebrate the 10th anniversary - Central Bank of Jordan. 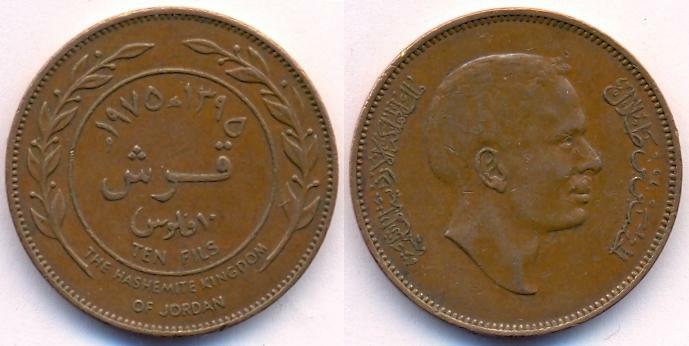 KM#15 5 Fils (½ Qirsh). Year: AH1395 - 1975. Weight: 5.90g. Metal: Bronze. Diameter: 24.00 mm. Edge: Plain. Alignment: Medal. Mint: British Royal Mint. Obverse: Value and date within circle surrounded by sprigs. "The Hashemite Kingdom of Jordan" written outside the circle at bottom. Reverse: "Al-Mamlaka(t) Al-Urduniya(t) Al-Hashemiya(t)" written on the left side anti-clockwise. "Hussein ibn Talal" on the right side anti-clockwise. Hussein ibn Talal. portrait in center facing right. Mintage: 9,000,000. Minted Years: AH1387-1968, AH1390-1970, AH1392-1972, AH1394-1974 and AH1395-1975. Ruler: Hussein ibn Talal. KM#16 10 Fils (Qirsh). Year: AH1395 - 1975. Weight: 9.90g. Metal: Bronze. Diameter: 27.50 mm. Edge: Plain. Alignment: Medal. Mint: British Royal Mint. Obverse: Value and date within circle surrounded by sprigs. "The Hashemite Kingdom of Jordan" written outside the circle at bottom. Reverse: "Al-Mamlaka(t) Al-Urduniya(t) Al-Hashemiya(t)" written on the left side anti-clockwise. "Hussein ibn Talal" on the right side anti-clockwise. Hussein ibn Talal. portrait in center facing right. Mintage: 5,000,000. Minted Years: AH1387-1968, AH1390-1970, AH1392-1972, AH1394-1974 and AH1395-1975. Ruler: Hussein ibn Talal. KM#17 25 Fils (¼ Dirham). Year: AH1395 - 1975. Weight: 4.75g. Metal: Copper-Nickel. Diameter: 22.00 mm. Edge: Reeded. Alignment: Medal. Mint: British Royal Mint. Obverse: Value and date within circle surrounded by sprigs. "The Hashemite Kingdom of Jordan" written outside the circle at bottom. Reverse: "Al-Mamlaka(t) Al-Urduniya(t) Al-Hashemiya(t)" written on the left side anti-clockwise. "Hussein ibn Talal" on the right side anti-clockwise. Hussein ibn Talal. portrait in center facing right. Mintage: 2,000,000. Minted Years: AH1387-1968, AH1390-1970, AH1394-1974, AH1395-1975 and AH1397-1977. Ruler: Hussein ibn Talal. KM#18 50 Fils (½ Dirham). Year: AH1395 - 1975. Weight: 7.40g. Metal: Copper-Nickel. Diameter: 26.00 mm. Edge: Reeded. Alignment: Medal. Mint: British Royal Mint. Obverse: Value and date within circle surrounded by sprigs. "The Hashemite Kingdom of Jordan" written outside the circle at bottom. Reverse: "Al-Mamlaka(t) Al-Urduniya(t) Al-Hashemiya(t)" written on the left side anti-clockwise. "Hussein ibn Talal" on the right side anti-clockwise. Hussein ibn Talal. portrait in center facing right. Mintage: 2,000,000. Minted Years: AH1387-1968, AH1390-1970, AH1394-1974, AH1395-1975 and AH1397-1977. Ruler: Hussein ibn Talal. 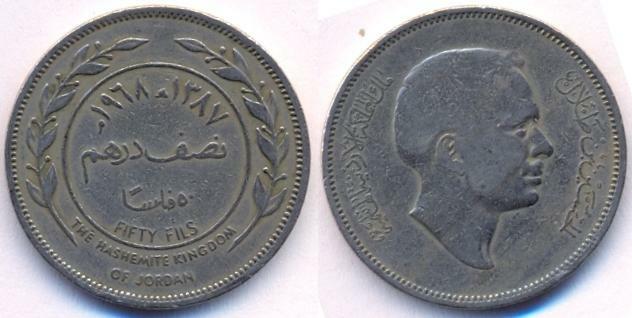 KM#19 100 Fils (Dirham). Year: AH1395 - 1975. Weight: 12.00g. Metal: Copper-Nickel. Diameter: 30.00 mm. Edge: Reeded. Alignment: Medal. Mint: British Royal Mint. Obverse: Value and date within circle surrounded by sprigs. "The Hashemite Kingdom of Jordan" written outside the circle at bottom. Reverse: "Al-Mamlaka(t) Al-Urduniya(t) Al-Hashemiya(t)" written on the left side anti-clockwise. "Hussein ibn Talal" on the right side anti-clockwise. Hussein ibn Talal. portrait in center facing right. Mintage: 2,500,000. Minted Years: AH1387-1968, AH1395-1975 and AH1397-1977. Ruler: Hussein ibn Talal. 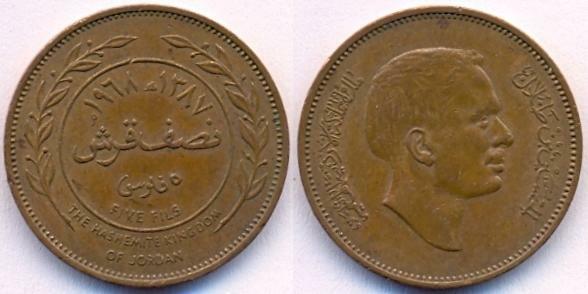 KM#28 ¼ Dinar (250 fils). Year: AH1395 - 1975. Weight: 17.00g. Metal: Copper-Nickel. Diameter: 34.00 mm. Edge: Reeded. Alignment: Medal. Mint: British Royal Mint. Obverse: Date within circle with a tree image, surrounded by sprigs. "The Hashemite Kingdom of Jordan" written outside, above the circle. Written denominations in Arabic and English below the circle. Reverse: "Al-Mamlaka(t) Al-Urduniya(t) Al-Hashemiya(t)" written on the left side anti-clockwise. "Hussein ibn Talal" on the right side anti-clockwise. Hussein ibn Talal. portrait in center facing right. Mintage: 100,000. Minted Years: AH1390-1970, AH1394-1974 and AH1395-1975. Ruler: Hussein ibn Talal. KM#50 50 Dinar. Weight: 15.98g. Metal: 0.917 Gold. Diameter: 28.40 mm. Edge: Reeded. Alignment: Medal. Mint: British Royal Mint was produced on Five-Year plan. Mintage: 250 (including proofs). KM#17 25 Fils (¼ Dirham). Year: AH1397 - 1977. Weight: 4.75g. Metal: Copper-Nickel. Diameter: 22.00 mm. Edge: Reeded. Alignment: Medal. Mint: British Royal Mint. Obverse: Value and date within circle surrounded by sprigs. "The Hashemite Kingdom of Jordan" written outside the circle at bottom. Reverse: "Al-Mamlaka(t) Al-Urduniya(t) Al-Hashemiya(t)" written on the left side anti-clockwise. "Hussein ibn Talal" on the right side anti-clockwise. Hussein ibn Talal. portrait in center facing right. Mintage: 1,600,000. Minted Years: AH1387-1968, AH1390-1970, AH1394-1974, AH1395-1975 and AH1397-1977. Ruler: Hussein ibn Talal. KM#18 50 Fils (½ Dirham). Year: AH1397 - 1977. Weight: 7.40g. Metal: Copper-Nickel. Diameter: 26.00 mm. Edge: Reeded. Alignment: Medal. Mint: British Royal Mint. Obverse: Value and date within circle surrounded by sprigs. "The Hashemite Kingdom of Jordan" written outside the circle at bottom. Reverse: "Al-Mamlaka(t) Al-Urduniya(t) Al-Hashemiya(t)" written on the left side anti-clockwise. "Hussein ibn Talal" on the right side anti-clockwise. Hussein ibn Talal. portrait in center facing right. Mintage: 6,000,000. Minted Years: AH1387-1968, AH1390-1970, AH1394-1974, AH1395-1975 and AH1397-1977. Ruler: Hussein ibn Talal. 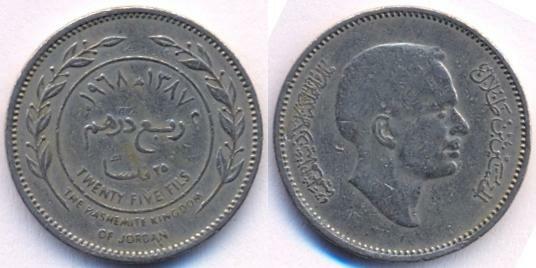 KM#19 100 Fils (Dirham). Year: AH1397 - 1977. Weight: 12.00g. Metal: Copper-Nickel. Diameter: 30.00 mm. Edge: Reeded. Alignment: Medal. Mint: British Royal Mint. Obverse: Value and date within circle surrounded by sprigs. "The Hashemite Kingdom of Jordan" written outside the circle at bottom. Reverse: "Al-Mamlaka(t) Al-Urduniya(t) Al-Hashemiya(t)" written on the left side anti-clockwise. "Hussein ibn Talal" on the right side anti-clockwise. Hussein ibn Talal. portrait in center facing right. Mintage: 2,000,000. Minted Years: AH1387-1968, AH1395-1975 and AH1397-1977. Ruler: Hussein ibn Talal. KM#30 ¼ Dinar (250 fils). Year: AH1397 - 1977. Weight: 17.00g. Metal: Copper-Nickel. Diameter: 34.00 mm. Edge: Reeded. Alignment: Medal. Mint: British Royal Mint. 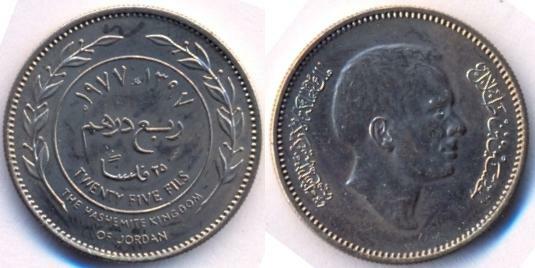 Obverse: "The Hashemite Kingdom of Jordan" written above. "The Silver Jubilee of King Hussein" above Petra. Written denominations in Arabic and English with dates below. 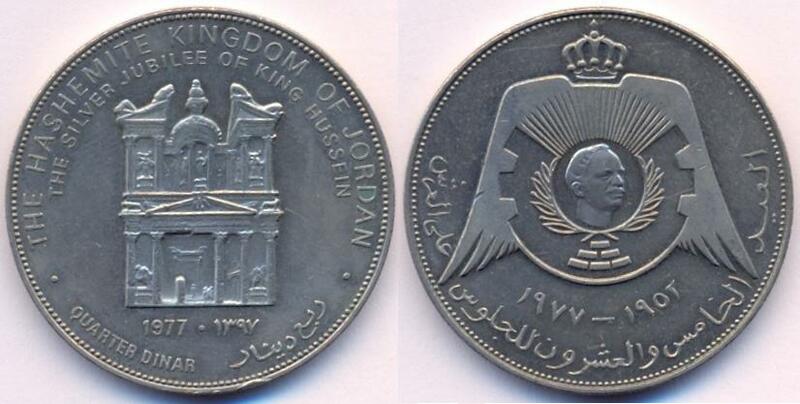 Reverse: Celebrating the 25 years of Hussein ibn Talal 1952-1977 on the throne and it's logo in the center. Mintage: 200,000. Minted Years: One year type. Ruler: Hussein ibn Talal. KM#33 25 Dinars 15.00g 0.917 Gold 29mm on the same theme was also produced (Mintage: 4,724). In 1977 Jordan joined the conservation series of endangered birds and animals by producing KM#31 2½ Dinars 28.28g 0.925 silver (Mintage: 6,265 + 5,011 Proof) featuring Rhim Gazelle, KM#32 3 Dinars 35.00g 0.925 silver (Mintage: 6,263 + 4,897 Proof) Palestine sunbird and KM#34 50 Dinars 33.4370g 0.900 Gold (Mintage: 829 + 287 Proof) featuring a bird. 750 - 868 and 905 - 935: Abbasid Dynasty. 1517 - 1918: Ottoman Empire. 1949: Abdullah I ibn al-Hussein. 1955, 1960, 1962, 1964-1965, 1967-1970, 1972, 1974-1975 and 1977: Hussein ibn Talal (current page). 1978, 1980-1981, 1984-1985, 1989 and 1991-1999: Hussein ibn Talal as part 2. 2000, 2004, 2006 and 2008-2009: Abdullah II ibn Hussein.